LUXURY GROUP II Ventilated Front Seats, Bi-Xenon HID Headlamps, Auto High Beam Headlamp Control, Rain Sensitive Windshield Wipers, LED Daytime Running Headlamps, 9 Amplified Speakers w/Subwoofer, 506 Watt Amplifier, Power Tilt/Telescope Steering Column, Quadra-Trac II 4WD System, Automatic Headlamp Leveling System, Dual-Pane Panoramic Sunroof, Radio: Uconnect 8.4, Nav-Capable! 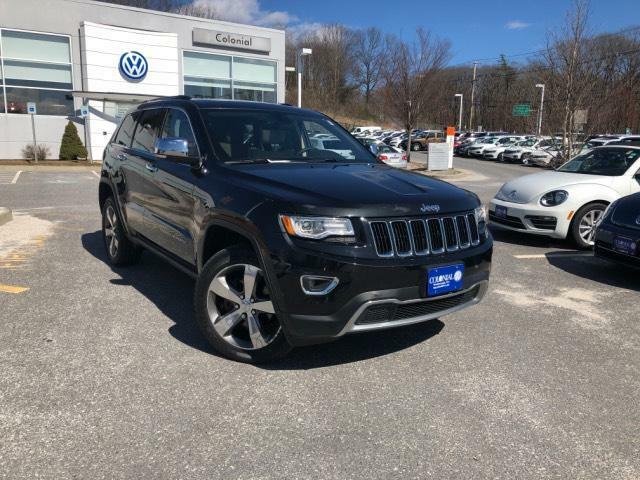 See Dealer for Details, Uconnect Access, For Details Visit DriveUconnect.com, 8.4 Touchscreen Display, Roadside Assistance & 9-1-1 Call, Integrated Voice Command w/Bluetooth, WHEELS: 20 X 8.0 ALUMINUM Goodyear Brand Tires, Tires: P265/50R20 BSW AS, RADIO: UCONNECT 8.4 NAV SIRIUSXM Travel Link, HD Radio, GPS Navigation, Uconnect Access, For Details Visit DriveUconnect.com, 8.4 Touchscreen Display, Roadside Assistance & 9-1-1 Call, Integrated Voice Command w/Bluetooth, SIRIUSXM Traffic, QUICK ORDER PACKAGE 23H Engine: 3.6L V6 24V VVT, Transmission: 8-Speed Automatic (845RE), High Pressure Tires Tracking, TRANSMISSION: 8-SPEED AUTOMATIC (845RE) (STD), ENGINE: 3.6L V6 24V VVT (STD). Highlights of this 2017 Honda Accord Coupe Touring include: CARFAX 1-Owner, GREAT MILES 23,568! EPA 32 MPG Hwy/21 MPG City! Navigation, Moonroof, Heated Leather Seats, Aluminum Wheels, Back-Up Camera. Highlights of this 2015 Jeep Wrangler Unlimited Sport include: REDUCED FROM $27,895! CARFAX 1-Owner, ONLY 37,613 Miles! 4x4, SIRIUS SATELLITE RADIO, iPod/MP3 Input, Brake Actuated Limited Slip Differential, CD Player, CONNECTIVITY GROUP, QUICK ORDER PACKAGE 24S, DUAL TOP GROUP. QUICK ORDER PACKAGE 24S Engine: 3.6L V6 24V VVT, Transmission: 5-Speed Automatic (W5A580), Deep Tint Sunscreen Windows, Leather Wrapped Steering Wheel, Chrome/Leather Wrapped Shift Knob, Tires: P255/75R17 OWL On/Off Road, Power Convenience Group, Front 1-Touch Down Power Windows, Remote Keyless Entry, Power Heated Mirrors, Power Locks, Security Alarm, Wheels: 17 x 7.5 Aluminum, Auto Dim Mirror w/Reading Lamp, DUAL TOP GROUP Premium Black Sunrider Soft Top, Black 3-Piece Hard Top, Rear Window Defroster, Tinted Rear Quarter & Liftgate Windows, Delete Sunrider Soft Top, Freedom Panel Storage Bag, Rear Window Wiper/Washer, TRANSMISSION: 5-SPEED AUTOMATIC (W5A580) Hill Descent Control, Tip Start, CONNECTIVITY GROUP Uconnect Voice Command w/Bluetooth, Vehicle Information Center, Tire Pressure Monitoring Display, ENGINE: 3.6L V6 24V VVT (STD). KBB.com's review says There's generous ground clearance, minimal overhangs, and that distinctive Jeep look, of course. Being equipped with 4-wheel drive, the Wrangler is nearly unstoppable off road.. Highlights of this 2016 Volkswagen Touareg Lux include: CARFAX 1-Owner. WAS $29,895. Nav System, Moonroof, Heated Leather Seats, Panoramic Roof, All Wheel Drive, DRIVER ASSISTANCE, Hitch, Aluminum Wheels. DRIVER ASSISTANCE FORCED PACKAGE - Consult dealer or distribution office for details, Adaptive Cruise Control (ACC), forward collision warning and autonomous emergency braking (Front Assist), Lane Departure Warning (Lane Assist), Heated Steering Wheel. Edmunds.com's review says There's a sense of substance and purpose in the way the 2016 Volkswagen Touareg goes down the road, but it's not so large that it ever feels unwieldy.. Highlights of this 2016 Toyota Highlander XLE include: CARFAX 1-Owner. PRICE DROP FROM $27,665, FUEL EFFICIENT 24 MPG Hwy/18 MPG City! Sunroof, Navigation, Heated Leather Seats, 3rd Row Seat, BODY SIDE MOLDING, All Wheel Drive, Alloy Wheels. Highlights of this 2016 Toyota Highlander XLE include: JUST REPRICED FROM $28,365, FUEL EFFICIENT 24 MPG Hwy/18 MPG City! LOW MILES - 38,478! Moonroof, Nav System, Heated Leather Seats, Third Row Seat, Aluminum Wheels, All Wheel Drive. Highlights of this 2016 Honda Pilot EX-L include: CARFAX 1-Owner, LOW MILES - 41,958! FUEL EFFICIENT 26 MPG Hwy/18 MPG City! Sunroof, NAV, Heated Leather Seats, 3rd Row Seat, Alloy Wheels, All Wheel Drive. Edmunds.com's review says Despite being appreciably more spacious and functional inside than most competitors, the Pilot is actually smaller and lighter than them as well. This relatively low weight combines with a stiffer structure to make the 2016 Honda Pilot feel impressively solid. . Highlights of this 2018 Ford Explorer XLT include: CARFAX 1-Owner. REDUCED FROM $28,665! Third Row Seat, Back-Up Camera, Flex Fuel, Rear Air, Aluminum Wheels, 4x4. Highlights of this 2018 Nissan Armada SV include: CARFAX 1-Owner. NAV, 3rd Row Seat, Heated Seats, All Wheel Drive, Rear Air, Alloy Wheels, [K01] DRIVER PACKAGE, [L92] 2ND & 3RD ROW CARPETED MATS, Tow Hitch. Edmunds.com's review says Surprisingly luxurious and easy to drive, the 2018 Nissan Armada offers ample power, room and utility.. Highlights of this 2018 Volkswagen Atlas 3.6L V6 SE include: CARFAX 1-Owner, GREAT MILES 17,642! REDUCED FROM $32,665! 3rd Row Seat, Heated Seats, Back-Up Camera, Rear Air, Alloy Wheels, All Wheel Drive. Edmunds.com's review says With ample cargo space in back, numerous storage bins throughout the cabin and second-row seats that can slide forward with child seats installed, the Atlas delivers above-average utility in this class.. Highlights of this 2018 Volkswagen Atlas 3.6L V6 SE include: CARFAX 1-Owner, ONLY 14,902 Miles! 3rd Row Seat, Heated Seats, Back-Up Camera, Rear Air, Alloy Wheels, All Wheel Drive. Highlights of this 2017 Volkswagen Golf R Golf R include: FUEL EFFICIENT 31 MPG Hwy/22 MPG City! NAV, Heated Leather Seats, Back-Up Camera, All Wheel Drive, Alloy Wheels, Turbo. The Volkswagen Golf R is a wildly entertaining hatchback with an abundance of power, the control of all-wheel drive and sporty handling that'll get your pulse racing. Even more significant, however, is that it also gets high marks for comfort and convenience. -Edmunds.com. Highlights of this 2016 Volkswagen Golf R Golf R include: EPA 30 MPG Hwy/23 MPG City! CARFAX 1-Owner. Heated Leather Seats, Back-Up Camera, All Wheel Drive, Alloy Wheels, Turbo. Impressive performance; civilized ride; upscale interior; generous cargo capacity; admirable fuel economy; standard all-wheel drive. -Edmunds.com. Highlights of this 2016 Volkswagen Touareg Lux include: CARFAX 1-Owner, GREAT MILES 35,936! Nav System, Moonroof, Heated Leather Seats, All Wheel Drive, Panoramic Roof, Hitch, Aluminum Wheels. There's a sense of substance and purpose in the way the 2016 Volkswagen Touareg goes down the road, but it's not so large that it ever feels unwieldy. -Edmunds.com. Highlights of this 2017 Volkswagen Touareg Wolfsburg Edition include: JUST REPRICED FROM $35,898. NAV, Sunroof, Heated Leather Seats, All Wheel Drive, Panoramic Roof, Tow Hitch, Alloy Wheels. Edmunds.com's review says It has responsive steering with plenty of road feel, and it stays stable and secure when you're going around turns. Luckily, none of this means it's uncomfortable on the highway. It's also quiet, smooth and confident over bumpy roads, all of which contribute to its luxury feel.. Highlights of this 2019 BMW X3 xDrive30i xDrive30i include: CARFAX 1-Owner. EPA 29 MPG Hwy/22 MPG City! Rear Air, Back-Up Camera, iPod/MP3 Input, Alloy Wheels, All Wheel Drive, Power Liftgate. Highlights of this 2018 Volkswagen Atlas 3.6L V6 SEL include: CARFAX 1-Owner, ONLY 13,545 Miles! JUST REPRICED FROM $39,665. Heated Seats, Sunroof, 3rd Row Seat, All Wheel Drive, Power Liftgate, Panoramic Roof, ROADSIDE ASSISTANCE KIT, Tow Hitch, Alloy Wheels. ROADSIDE ASSISTANCE KIT booster cables, warning triangle, LED flashlight, multi-tool, work gloves, PVC tape, blanket, poncho, whistle, cable ties, bandages. Highlights of this 2019 Chevrolet Suburban LT include: CARFAX 1-Owner. WAS $47,000. NAV, Heated Leather Seats, Alloy Wheels, Rear Air, Power Liftgate, 4x4, Tow Hitch, ENGINE, 5.3L ECOTEC3 V8, AUDIO SYSTEM, 8 DIAGONAL COLOR TOUCH. TRANSMISSION, 6-SPEED AUTOMATIC, ELEC. 8 DIAGONAL COLOR TOUCH-SCREEN NAVIGATION WITH CHEVROLET INFOTAINMENT AM/FM stereo with seek-and-scan and digital clock, includes Bluetooth streaming audio for music and select phones; voice-activated technology for radio and phone; and Shop with the ability to browse, select and install apps to your vehicle. You can customize your content with audio, weather and more; featuring Apple CarPlay and Android Auto capability for compatible phone; 5 USB ports and 1 auxiliary jack, TRANSMISSION, ELECTRONICALLY CONTROLLED with overdrive and tow/haul mode (STD), 5.3L ECOTEC3 V8 with Active Fuel Management, Direct Injection and Variable Valve Timing, includes aluminum block construction (355 hp [265 kW] @ 5600 rpm, 383 lb-ft of torque [518 N-m] @ 4100 rpm) (STD). TheCarConnection.com explains The 2019 Chevrolet Suburban sports a crisp, handsome exterior and a comfortable, car-like interior that help to hide its considerable size.. Highlights of this 2016 Volkswagen Touareg Lux include: Nav System, Heated Leather Seats, Moonroof, All Wheel Drive, Hitch, DRIVER ASSISTANCE, Aluminum Wheels, Panoramic Roof, Turbo Charged Engine. FUEL EFFICIENT 28 MPG Hwy/21 MPG City! Highlights of this 2018 Land Rover Range Rover Velar S include: Non-Smoker vehicle, Recent Arrival! One owner trade, CARFAX 1-Owner, Excellent Condition, GREAT MILES 4,136! REDUCED FROM $58,995! EPA 27 MPG Hwy/21 MPG City! Leather, Nav System, Moonroof, Panoramic Roof, 4x4, Aluminum Wheels, Turbo Charged Engine. KBB.com explains Its beautiful exterior is bolstered by the elegant, tech-friendly interior, with the same level of quality materials Range Rover owners have come to expect..